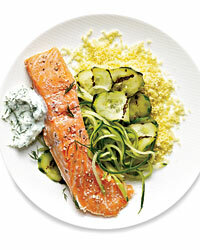 Chef Maria Hines turns salmon buttery-soft and rare in just 12 minutes. For more-well-done fish, up the water temperature. 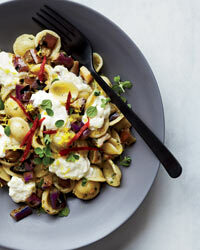 Chef Missy Robbins makes this elegant, decadent pasta dish with burrata, the creamy cow's-milk cheese from Italy. She says, "I absolutely love burrata, but this recipe also includes my trifecta of favorite ingredients: marjoram, lemon and chiles." In this clever recipe, Jason Stratton makes a simple, creamy sauce by simmering toasted pine nuts with lemon zest and chicken stock, then pureeing them. 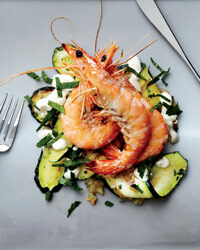 His other smart trick: cooking shrimp on a superhot bed of coarse salt flavored with bay leaves and lemon zest. 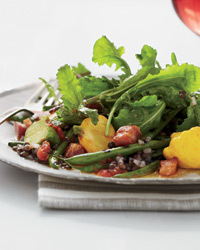 Most cooks boil, steam or sauté green beans, but grilling themas Alex Seidel does heregives them a delicious char that's superb with the lentils, pancetta and baked tomatoes in this salad. Pastry chef Ed Jiloca taught himself by scouring cookbooks and websites. 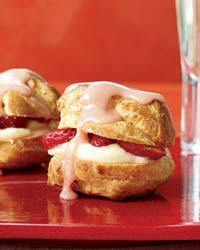 As these luscious cream puffs prove, he's become a master.